It seems spinning hard disk drives are alive and well with Seagate upping the ante with a new 15,000 RPM, 2.5” form factor, hard disk aimed at mission-critical enterprise use. 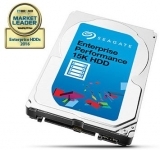 Its Enterprise Performance 15K HDD Version 6 features capacities from 300GB to 900GB and the industry’s highest data performance (up to 315MB/s sustained transfer rate), 2 million hours MTBF (mean time between failures) and a low annualised failure rate of 0.44 percent. It is best suited for mission critical data and being a 2.5” form factor will fit into laptops to servers with the SAS 12Gbps interface. 15K is interesting as it reduces latency which is important for both complex renderings to high data transactions. Seagate claim a 10x faster response time in real-world workloads and a 3x improvement over its Generation 5 drives. The 2.5” size opens this up for use in 1RU servers as well. It can use the 512n format or a new Fast Format feature for advanced formats (4Kn and 512e).